The second generation Flip MinoHD camcorder from Pure Digital Technologies started shipping this week. 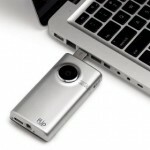 The tiny HD video camera stores 120 minutes of 1280×720 resolution video on 8 GB of built-in memory, requiring no additional memory. Video is recorded at 30 frames-per-second (progressive scan) at an average bitrate of 9.0Mbps. Video compression is H.264, audio compression AAC, and output format is MP4. 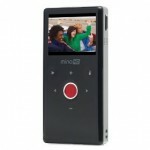 The MinoHD has a large 2-inch (diagonal) LCD display — especially large considering the width of the MinoHD is just 2″. Resolution on the display is 960×240. Lens type is a fixed focus f/2.4 (0.8m to infinity). The wide aperture helps in low-light situations, along with the camera’s 1/4.5″ HD CMOS Sensor. A 2x digital zoom allows you get a bit closer to your subject. Battery life is rated at up to 2 hours with the internal Lithium-Ion rechargeable battery. 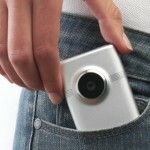 Additional things to mention are the built-in speaker, wide-range stereo microphone, HDMI out, and tripod mount. 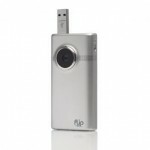 The second-generation Flip MinoHD retails for $229 and is available at Amazon.com, TheFlip.com and other retailers.